Nevertheless, their home is an unholy mess, in several senses of the term. Avraham and Shraga inherited the building from their parents. Despite the fact that they look to be of a pretty advanced age themselves, the fellows still seem in need of a parent of sorts. When a company called Home Clean Home comes in and takes action, the head of the crew begins to work not just as a sanitation manager but as a therapist to the brothers. “I’m sad to see you like this,” the Home Clean Home man (he’s never named) says to one twin after a particularly brutal sweep has been executed in one section of the house. “It has to be done,” sighs the shamed resident, taking solace in a glass of wine. “I’m addicted to the alcohol,” he explains. 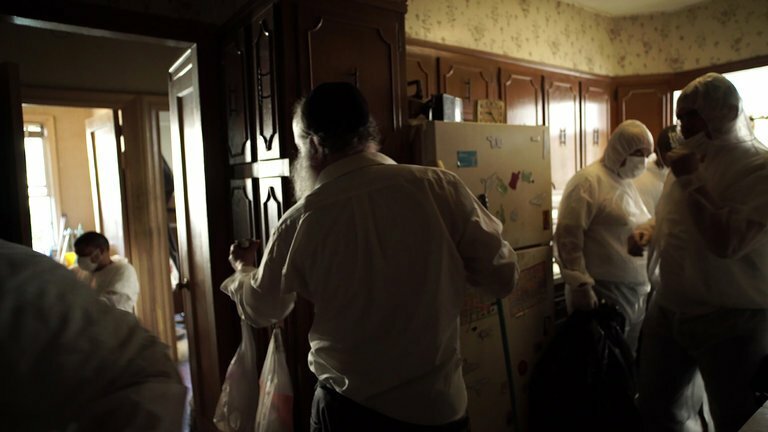 The movie, directed by Antonio Tibaldi and Alex Lora, is quiet and quietly moving and quite different from “Hoarders” in its steady pace and poetic vérité style. It’s a story of unlikely friendship — not to mention a potentially very good promotional tool for Home Clean Home, which does a thorough and, more to the point, exquisitely sensitive job.